Ellie works in a marketing office in the city. She wakes up at the same time every morning and hurry to get dressed. Thirty minutes later, she’s walks out of her local cafe with a hot coffee in hand and tries to hail a cab. She reaches the office and starts on her tasks immediately. The clock strikes five but she realized she has not finished all her reports yet, so she’ll have to work longer. Finally, she finishes just in time for dinner. She goes out with friends to let loose for a while. A taco and a beer later, she goes home, and sleeps. Repeat the next day. Does Ellie’s routine sound familiar to you? You are not alone. A lot of people in the world are living in this same routine. Ending the day with no more time or energy left. It’s easy to imagine how it can be difficult to squeeze in personal time in this fast-paced world — let alone time for fitness! If you think about fitness as going to the gym for 90 mins or more everyday, it may seem daunting. You will feel like you are already tired just thinking about it. Fitness does not mean that you have to start running five kilometers everyday or lifting 20kg-weights for your squat exercises. Time for fitness can mean something as simple as walking. Walking is an underrated form of exercise for people who do not like exercise. It does not require any equipment. All you need is a pair of comfortable shoes. You do not need to watch some guy from Youtube to teach you the proper form. Walking can even save you money from transportation! If that’s not enough, let us look at the other ways walking is beneficial to our well-being. According to The Doctor on Demand Diet by Melina B. Jampolis, MD, “research shows that regular walking actually modifies your nervous system so much that you’ll experience a decrease in anger and hostility.” Physicians and psychiatrists highly recommend walking to help uplift mood. Next time you are upset about something at work, turn it into something positive and walk outside for a couple of minutes. A breath of fresh air coupled with a medium-paced walk will help clear your mind. Our bones and muscles degenerate as we age. They become weaker especially if we do not exercise. Walking regularly prevents losing bone density. It also helps to keep your leg and back muscles on the move. Just don’t forget to stretch if you are planning to go on longer walks. There is science to back up the claims that walking after you eat can prevent that bloated feeling. A study done in 2008 showed that it speeds the rate at which food moves through your digestive system. 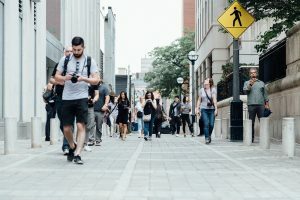 Another study found that walking for at least 15 minutes shortly after a meal can improve blood sugar levels because the glucose in the bloodstream gets absorbed by your muscles at work. Walking actually gives you a fighting chance against a good number of diseases. It controls your sugar so you already have better odds against diabetes. It also helps regulate blood pressure and improves blood circulation to prevent cardiovascular diseases. A sixty-minute medium-paced walk everyday can have the same effect as running to increase your lung capacity. But remember that you need to walk faster than a “leisurely pace” for this to work. Once you have gotten used to the walking routine, increasing your pace and distance will come naturally. Now for the best part. A lot of people want to exercise for this reason but in reality, this is just the cherry on top after all the health benefits I have listed above. Adding thirty minutes of brisk walking on top of your everyday activity can burn about 150 more calories a day. More walking and a faster pace will burn more calories. Partnered with a healthy diet, this can be one of the easiest ways to lose weight and keep it off. 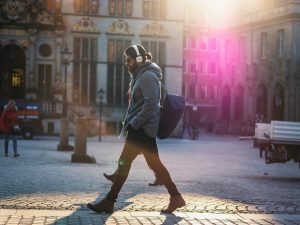 Now how do you incorporate walking into your daily routine? If you take the metro to work, you may take it on the station after the one you usually go to. This will allow you to walk regularly at the same time of day. This is helpful in making you stick to the regimen. Walk after your office lunch. A brisk walk around your block or twice around serves not only your need for exercise but also as a break from your work. Stretch out your legs and stare at something other than your computer screen. You can walk your dog or the neighbor’s dog. Opt to take the stairs instead of the elevators. As a beginner, remember that you need to set a pace that you are comfortable with. Do not force yourself to walk so fast that it is not enjoyable anymore. As a rule of thumb, experts say that the optimum pace is when you are using between 50% to 80% of your heart rate. Now what does this mean? Find the speed where you can still talk comfortably but you cannot sing anymore. Once you have gotten used to the walking routine, start to challenge yourself. Track your steps and pace using a pedometer. You do not need to buy a fancy smartwatch or fitness band. Most smartphones has this functionality built-in nowadays. Seeing the steps you make and your progress can be fulfilling and will even motivate you to do better. Set increasing speed and step goals for yourself. There are a lot of mobile apps out there that can help you with this. If you are a competitive person, use this to your advantage and compete with other people. Better yet, try to get friends to walk with you so that you can turn it into a social experience as well. Fitness need not be tedious, stressful, and unenjoyable. Take that first step now!